After several years with Blogger I am moving over to WordPress. Blogger did some odd design things to my blog and I simply do not like it anymore. I've enjoyed sharing this art journey with you all, your comments and thoughts inspire me and I would love for you to continue on the trip. WordPress was supposed to import my followers and subscribers to my new blog but it didn't so I invite you to visit the new blog to subscribe and to read my latest post Exploration - Tulips to Tigers. It's all about exploration in art and life. 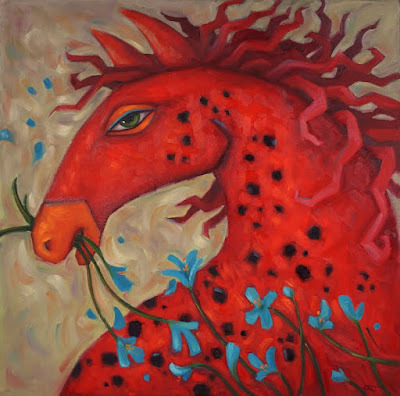 Carmine Reverie is part of a series of horse paintings that started last year when my husband and I saw some gorgeous appaloosa horses in a pasture. I knew I would paint them at some point but what I would do with them wasn't immediately apparent. That's inspiration for you, sometimes it's there, only partly formed until one day bits and pieces of ideas start falling into place. This is #5 in the series with more to come. You can see the rest at www.cindyrevell.com. 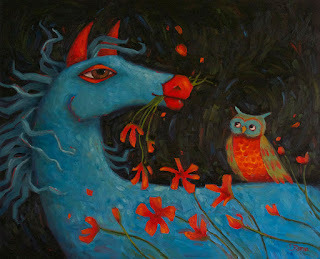 And you can see Carmine Reverie at Lando Gallery in Edmonton, AB. My neighbour has a couple of peacocks. They like to perch on the roof of the house or her deck railing and they like to stand right in the middle of the road. I have some of their lovely feathers which eventually inspired this painting. Sometimes it takes a long while for an idea to come together. And is often the case in my work there is a hint of mystery in the painting - is he getting or giving something? Inspiration. It's everywhere and is filtered through other things that resonate with us. 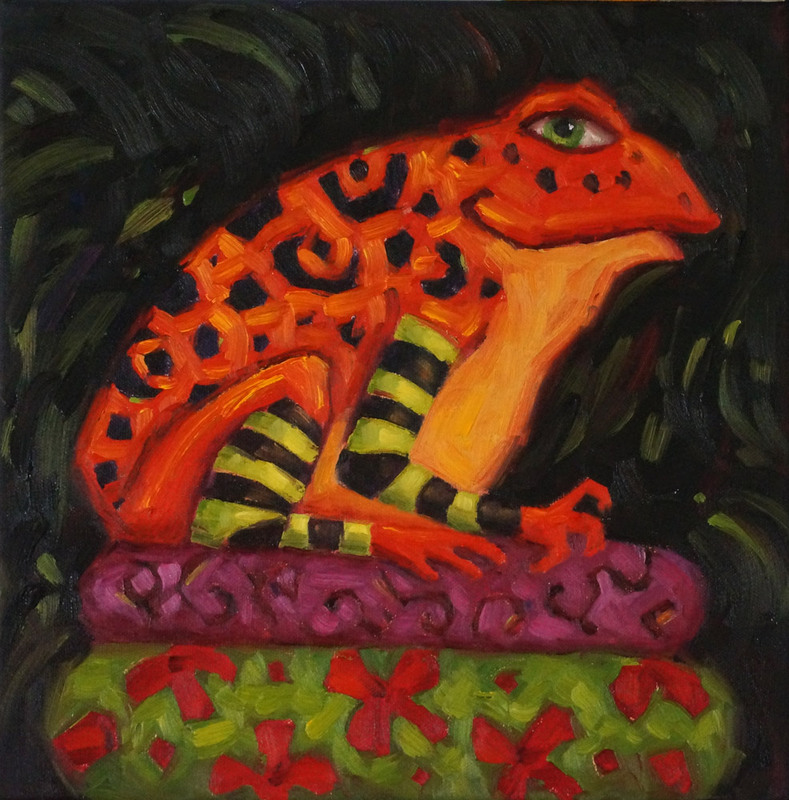 Jeremiah, the orange frog was an idea that came to me after a trip to the greenhouse where I saw a huge 4 foot tall green resin frog nestled among the water plants. 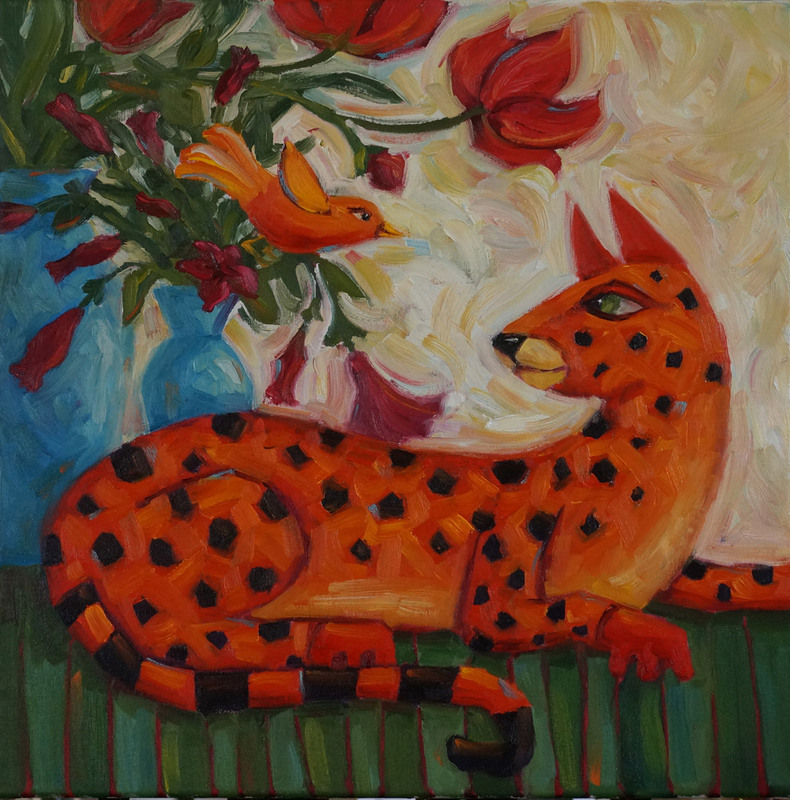 Ok, so Jeremiah is not green but I'd just painted the orange wild cat/cheetah/leopard hybrid Tangerine Reverie which was partly inspired by my petunias and was still in the mood to paint orange. 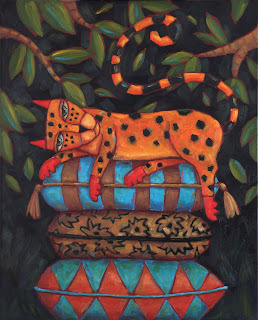 And more spots, stripes, flowers and pillows, motifs that I explore again and again in various ways. When I paint realism my subject matter is usually still life and here it appears as the setting for Tangerine Reverie. You'll see piles of pillows in Maybe Later and The Art of Resting about 6 posts down from January 2015 and March 2013 which also show up in Jeremiah. It's a lovely organic melding of past ideas that I'm not finished exploring. These past months have been filled with inspiration as I paint for my upcoming solo show "Be Your Own Bird" October 15, 2015 at the Daffodil Gallery. 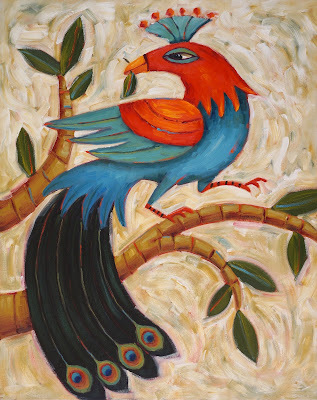 In this new series of paintings birds are the common element in a menagerie of uncommonly coloured exotic cats, horses and other animals that symbolize trusting in and being your unique self. We are spiritual creatures, enjoying our time on earth as individuals, different from one another with our own stories and paths to take yet interdependent and connected as suggested by têtê-a-têtês between the animals. I love colour. Colour with a shot of black. Yummy. But this black leopard needed to really stand out and using a more limited palette achieved that. 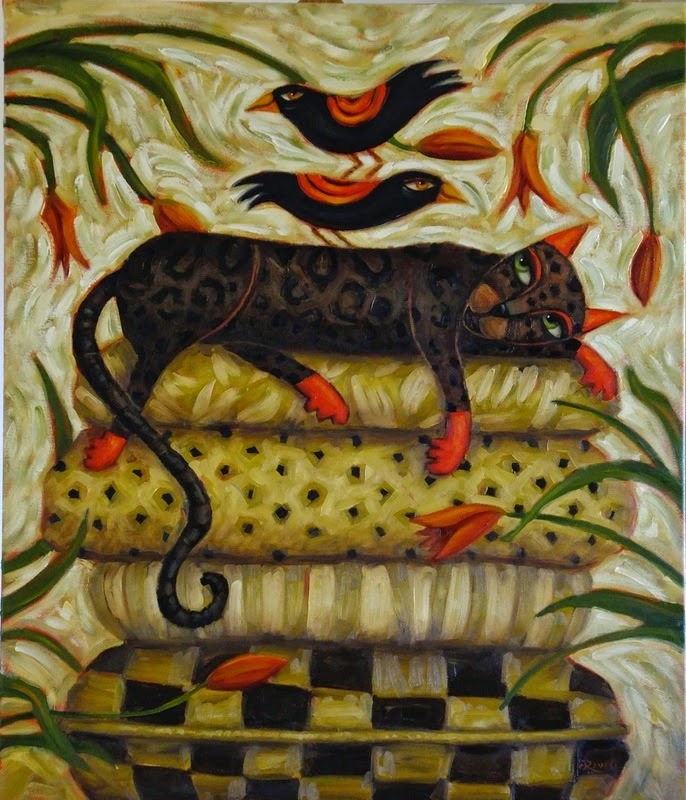 Limitations have a special role to play, they can provide focus and direction which may seem kind of a funny thing for me to say since my work ranges from whimsical illustration in 3 different mediums (scratchboard, acrylic and digital) to realistic oil painting to whimsical oil painting. To see how focus and direction can be fun and not boring at all visit my brand new website which includes 4 different portfolios, different but very much connected through colour. For those of you who followed this blog because of the still lifes I hope the shift away from realistic still life wasn't a disappointment. In fact, I hope the shift brought fun and pleasure. I've learned that exploration provides inspiration for other areas of one's art and is of great value. Stick around, I'm not done with still life just yet. Thank you for being part of my art circle. Painted one hot afternoon on the deck outside my studio. 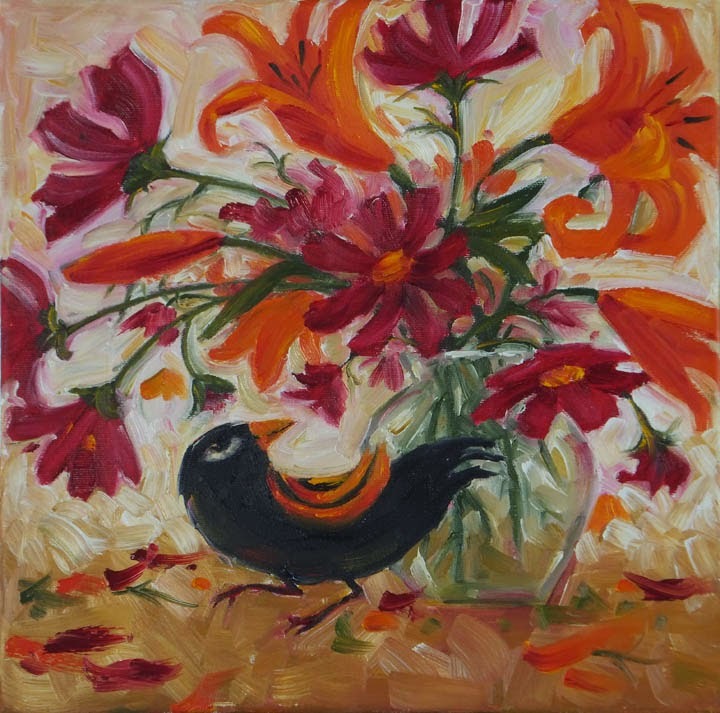 Inspired by the the glorious colours of cosmos and lilies in my garden and the blackbirds that play by the pond. 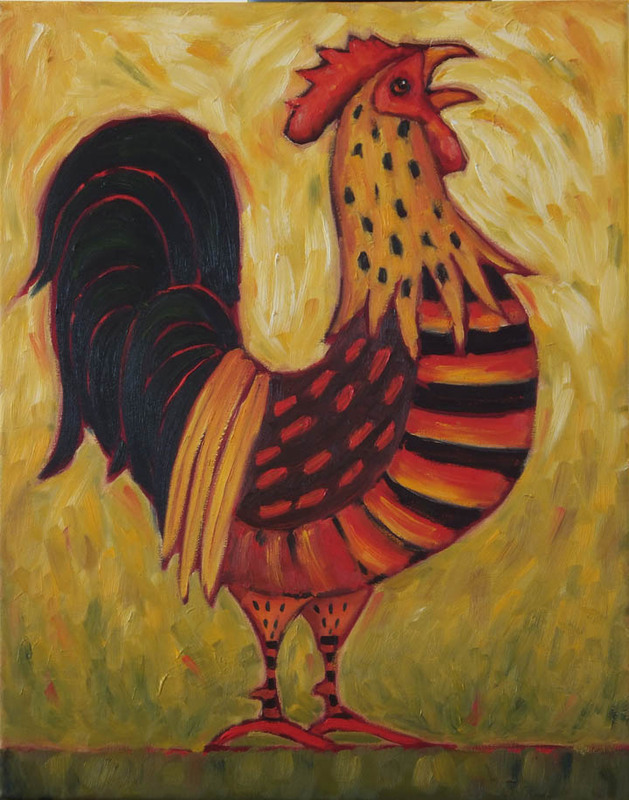 Morning Call was loosely inspired by my lovely bantam rooster Vincent who, in real life, has an interesting shock of orange feathers on either side of his comb reminiscent of the pageboy type hairstyle worn by a young Vincent Van Gogh. His hearty crow announces each new day. This is our dog Pete, a handsome fellow with huge ears which were laid slightly back in the wind making them look rather average in this depiction. At only knee height Pete is short but his enthusiasm and love are tall. This painting was a gift for my husband. As the years have gone by I'm discovering a real love of painting in a more expressive manner. Lively brushstrokes and more interpretive colour have become more important to me versus painting exactly what I see. Although in this little painting the colour is, for the most part, as I saw it. The brushstrokes however, are looser and more descriptive than my usual work and I'm happy about that. 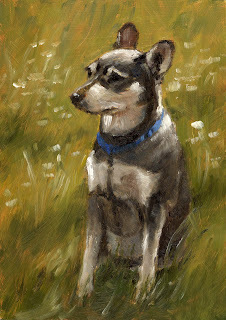 This painterly and more expressive way of painting has an energetic give and take that I love! 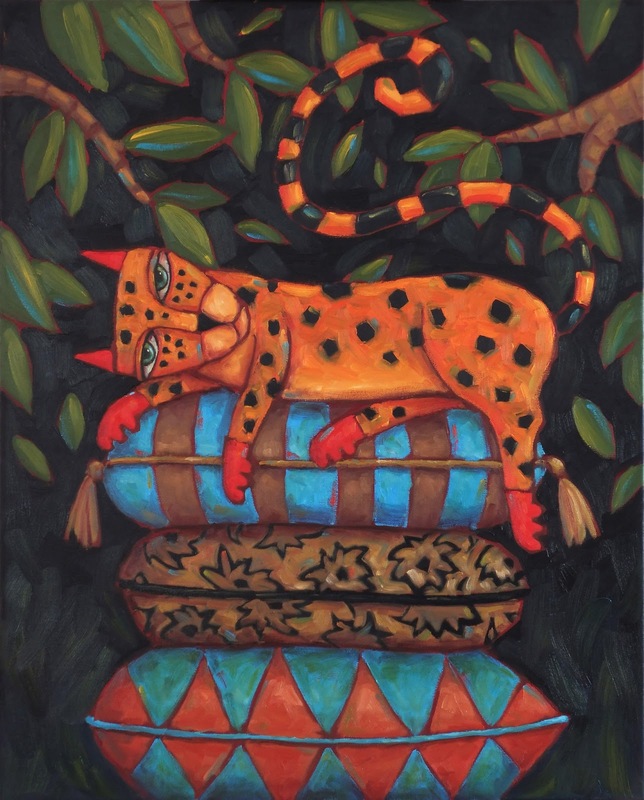 'The Art of Resting' was painted after a month or so of doing primarily still life. As much as I love the zen of still life the lure of playing with my imagination and going wild with colour is irresistible. It's fascinating to see the links and threads of one's own creative life, to see how old unformed concepts connect to the present. Even though I have only been painting these whimsical cats, birds and flowers for a couple of years the idea for something along these lines was lurking about only as rough scribbles for illustrations in sketchbooks and bits of paper. 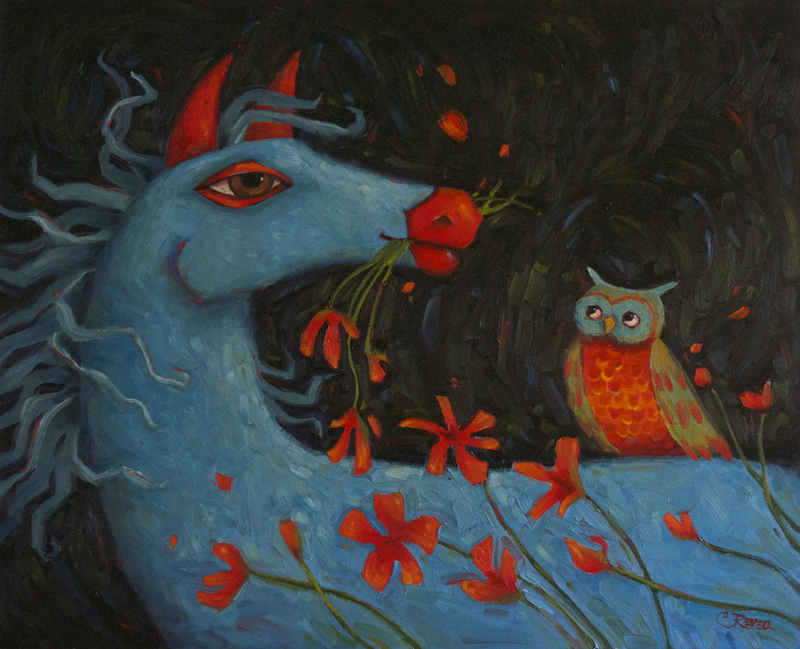 An idea that was sketched out years ago and found in a file cabinet was the inspiration for this painting. Suddenly I'm grateful for my propensity to note everything and save those scraps of paper that litter the studio, you never know when an old idea will come to life. To get the paintings delivered to your inbox subsribe via email.